"Nigiri is a kind of sushi made with vinegared sushi rice (shari), and a slices of fish, seafood, or vegetable. Nigiri sushi is easier to make than maki, or uramaki sushi, and some would say even easier to consume.It is customary to present nigiri sushi pieces in couples, as a sign of peace and harmony." With your hand wet, grab about 20 grams of shari rice, and shape it to a long, oval from. The rice is going to be the base for the fish to lay on, so the bottom should be flat, and the top could be more rounded. The sides should definitely be a bit rounded. 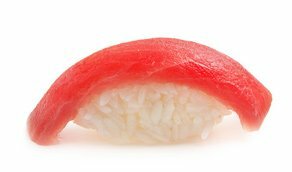 As already mentioned, nigiri sushi topping can vary, but the basic form is “plain” salmon nigiri. So if it is salmon or tuna fish nigiri sushi you are making, the following measurements should be just fine. Take a slice of fish, about 1 cm thick, 5 cm long and 3 cm wide. If the piece of fish you are cutting from is smaller, and does not allow you to cut such a slice, try slicing it at 45 degrees, it will allow you maximum “fish surface”. Take a pea-sized portion of wasabi, and smear it along the middle of the fish slice. The wasabi will help the slice glue to the piece of rice, to form a steady nigiri sushi. Now it’s time to place the slice of fish, with the wasabi side facing down, on the rice. Lay it gently on the rice, and then press it firmly to stick with the rice. You might want to use the other hand to hold the nigiri sushi from the sides while pressing it from above, to avoid “rice loss”. Well, the best thing is to get sushi equipment and ingredients to start with. Check out our sushi e-Store, for sushi kits and more. You might also want to know how to prepare sushi rice, or to read more about sushi grade fish for your sushi roll. 5 Responses to How to make Nigiri sushi? Great read! I actually stumble to this site and I’ve learnt something great. I will sure put this into practice. Many thanks! Hey.. I just wanna say thanks to you. I loved this nigiri sushi a lot but I never had any clue on how to do it. I came across the directives here and decided to get the ingredients and try it and it worked out perfectly. I’m so happy. Thanks again! This is obviously oversimplified, yet clear enough. Thanks.